Last August a convoy of trucks carrying a concentrated form of this waste traveled from northern West Virginia to Irvine, Kentucky. The small town in Estill County lies near the Kentucky River, where Appalachian hills give way to rolling farm country. The trucks were headed for a municipal waste facility called Blue Ridge Landfill. Just across Highway 89 from the landfill is the home where Denny and Vivian Smith live on property where their ancestors have lived since the 1800s. From their sun porch, facing east, the Smiths can see the entrance to Blue Ridge Landfill. From their front door, facing west, they can see Estill County High School and Estill County Middle School, with a combined enrollment of about 1,200 students. The trucks that arrived in Irvine last summer left more than 400 tons of low-level radioactive waste in a facility that was not engineered or permitted to accept that sort of material. That has left the community, the parents of schoolchildren, and especially the Smiths with a lot of questions and concerns. “We are getting older and we feel like we’re kind of vulnerable to illnesses with what’s going on at the landfill,” Vivian Smith said. The question now reverberating through Irvine and the state agencies investigating the incident: How did this happen? The answer, in part, lies in the weak federal oversight and patchwork of state regulations regarding this type of waste. A report from the Center for Public Integrity calls the radioactive waste stream from horizontal oil and gas operations “orphan waste” because no single government agency is fully managing it. Each state is left to figure out its own plan. Ohio, for example, hasn’t formalized waste rules, while New York, which banned fracking, still allows waste disposal “with little oversight,” according to the Center. While Creating Energy Antero Resources petroleum engineer Tom Waltz points to eight, green, 16,000-gallon above-ground storage tanks at the edge of a drilling pad in Doddridge County, West Virginia. “They hold produced water that the producing wells make,” he explained. 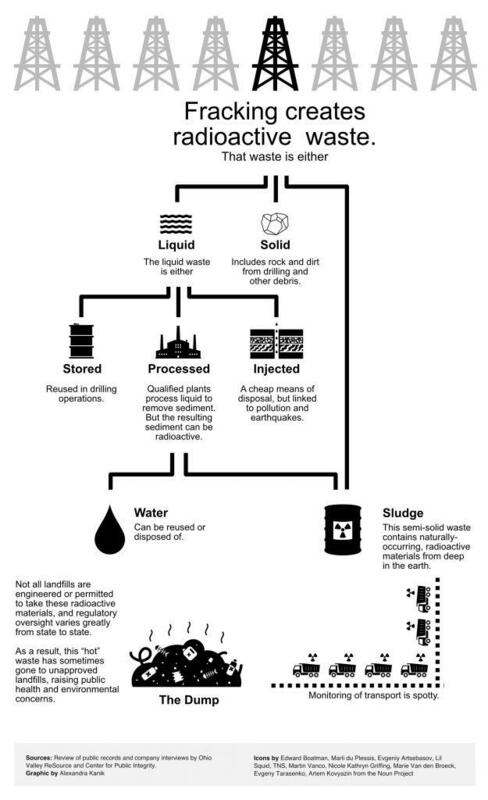 Produced water is one form of drilling waste. It’s salty water laced with chemicals, metals, and naturally occurring radioactive elements that come up thousands of feet along with the gas and oil. Antero is the country’s eighth-largest gas drilling company and operates hundreds of sites like this, producing hundreds of thousands of barrels of waste. The easiest way to get rid of wastewater is to inject it back into the ground, but that can lead to pollution and even earthquakes. One of Antero’s lead civil engineers, Conrad Baston, says processing the wastewater – separating it into salt, sludge, and water – is becoming more attractive. Antero is spending $275 million to construct a wastewater facility in West Virginia which is scheduled to begin operation in September, 2017. At its peak, the facility could see up to 600 trucks a day, processing 60,000 barrels of wastewater. A filtering system would recover about two-thirds of the water, which could be reused in drilling. But that filtration system leaves behind thousands of tons of salt and hundreds of tons of sludge from the sediment, which concentrates the radioactive materials. Baston said that sludge — as much as 180 tons a day — will be disposed of elsewhere. Baston couldn’t say which facilities or where, but he said Antero is exploring options across the country. West Virginia’s Department of Environmental Protection said no approved facilities exist in the state. That would mean the waste will have to cross state lines. An Antero spokesperson said waste from their facility will go only to approved and vetted landfills. The Center for Public Integrity report shows that regulators acknowledge that this waste is effectively being “shopped around” by companies hoping for affordable disposal. Antero officials maintain that industry has no other choice. Records filed with the West Virginia Bureau for Public Health show that a company Antero had contracted with to process its wastewater, Fairmont Brine, was the source of the waste that wound up in Blue Ridge Landfill in Irvine, Kentucky. Antero officials said their company is not responsible for how that waste was disposed of. Officials at Fairmont Brine did not respond to requests to comment for this story. 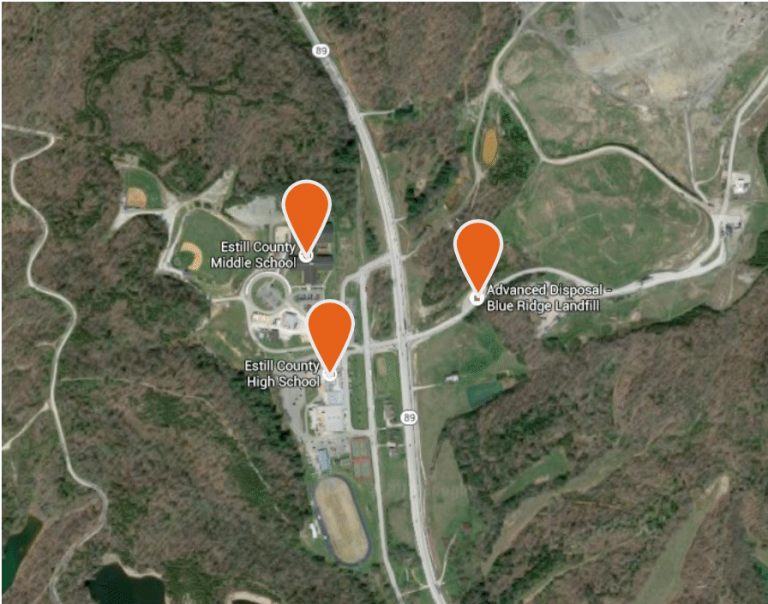 Since reporters at the Louisville Courier-Journal first reported on the improper dumping of fracking waste in Kentucky, community leaders in Irvine have been asking for answers. 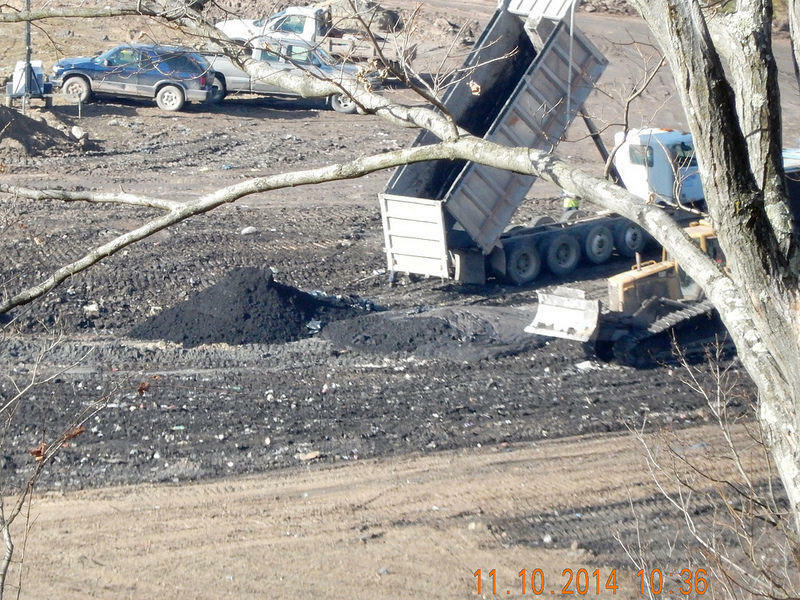 The landfill is under investigation by multiple state agencies for accepting the waste. The Smiths have had their share of illnesses and they wonder what effect the radioactive waste might have on them or on the children who attend school nearby. This low-level radioactive waste is not as hazardous as the wastes from nuclear power. But according the the Environmental Protection Agency, the radioactive materials in drilling waste do present risks. Radioactive dust is potentially harmful and it would be bad if the radioactive leachate, or liquid that oozes out from the landfill, were to contaminate groundwater over time. Radioactive waste can last centuries — far longer than the engineered lifespan of the liners in many landfills. Officials with Blue Ridge Landfill’s parent company, Advanced Disposal, declined to comment while under investigation. The Smiths hope that investigation will shed light on any risks they might be living with because of the hot mess left next door.